I went for a run this morning. The key to this is to not think about anything from the moment I wake up to the moment I put on my shoes and go out the door and start moving my feet. If I start thinking for even one second, then I think about how my knees will be stiff and my ankles will crack, and I’m going to be cold for the first five minutes and then start sweating and breathing heavily and the whole thing is rather uncivilized and awful. That’s why it’s imperative to avoid thinking of any kind. Out the door I went and instantly uphill. Up and up the hill I went, into the heart of the area directly south of the Inner Sunset, an area I think is called Ashbury Heights but I’m not certain. While the rest of the Sunset is laid out in a neat grid with the streets named alphabetically and numerically (Judah, Kirkham, Lawton, Moraga and 11th, 12th, 13th, etc.) the area directly south of me is a mess of hills and tangled streets. At some point 9th and 12th avenues intersect, something unfathomable to most people. It’s San Francisco’s equivalent of the Bermuda Triangle. Houses have yards and fountains, strange intersections occur and streets change into other streets as they curl around hills, and nothing really makes sense. 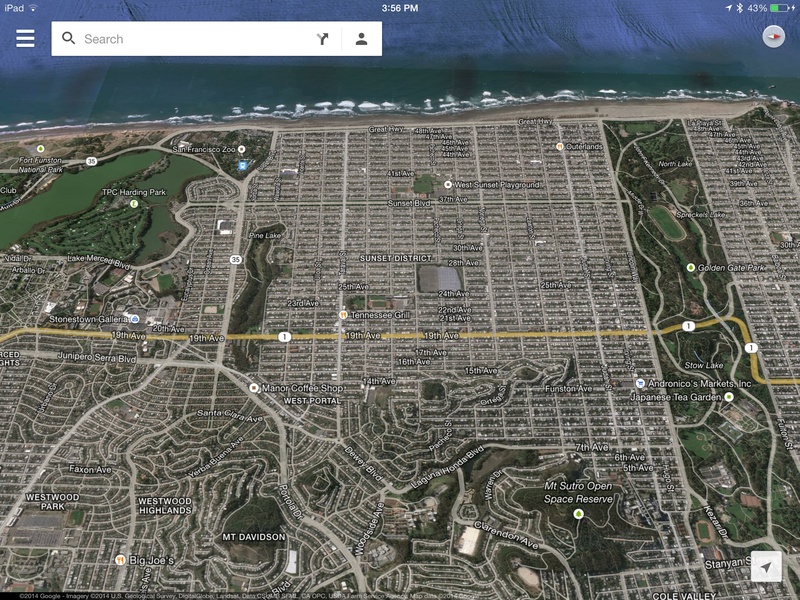 I was near the point where Pacheco turns into Funston Avenue. If you’re not familiar with the area, you probably don’t get how bizarre that is. I might as well say that I was in the part of New York City which is built like a giant picnic basket and governed by people-sized ants. At any rate, I was in that improbable area when I suddenly got a glimpse of the ocean. This was interesting because I thought I was facing the other direction, but it turns out my inner compass had been Bermuda’d and there it was, the Pacific Ocean with what looked like a giant winged sea monster perched on the beach. That was strange, I thought, and continued to run because that’s what you do when you’re not really thinking. I turned around about thirty seconds later and there it was again, the view of the Pacific and the giant, solitary, motionless winged sea monster. It looked lonely almost, and actually very tiny against the ocean and the endless street blocks of the sunset and their pale pastel squares. It was probably debating on the best way to attack, which public utilities to hit first or maybe where it could cause the most damage and terror. Or maybe it wasn’t trying to attack at all. Maybe it had come to San Francisco just like many others have come here, looking for fellow dreamers and creative types to do the impossible with. Maybe it wanted to learn how to code, or already knew how to code and had a cool new app idea but needed funding. Maybe it was frozen against the city, stuck thinking of all its passions and dreams and hopes with no idea of where to begin and feeling a little homesick in the fog. Maybe it was afraid of missing the best opportunity. I don’t know what was going through its reptilian brain and its cold blood, but I hope it figures everything out, and that it doesn’t cause too much damage on the way to its destiny. Also, I think it was a windmill.